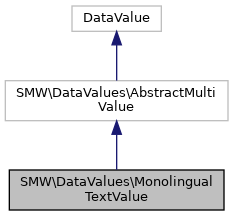 MonolingualTextValue requires two components, a language code and a text. A text foo@en is expected to be invoked with a BCP47 language code tag and a language dependent text component. Internally, the value is stored as container object that represents the language code and text as separate entities in order to be queried individually. External output representation depends on the context (wiki, html) whether the language code is omitted or not. No explicit check is made on the validity of a language code and is expected to be done before calling this method.